Daseke Inc. will end the year with the same frenetic pace it began 2017 after announcing that three new carriers will join its conglomerate of trucking companies, bringing the number of new additions to seven since Jan. 1. The new transactions cap off a year in which the once-private company joined the Nasdaq stock market after a merger with Hennessy Capital Acquisition Corp. in February. The Dec. 1 merger brings Tennessee Steel Haulers and Co., Roadmaster Group and Moore Freight Service Inc. into the Daseke brand, which used a combination of cash and stock to fund the $270 million cost, including 4.2 million Daseke shares worth $53 million. Daseke’s revenue, earnings before interest, tax, depreciation and amortization (EBITDA) and fleet size will grow about 40% each through the transactions, the Addison, Texas-based carrier said. In total, Daseke’s family of companies generated $1.2 billion in revenue adjusted EBITDA of $140 million during the previous 12 months. By the end of 2018, Daseke aims to raise adjusted EBITDA to $170 million. Like the previous deals, Daseke will keep the current management in place at Tennessee Steel Haulers, Roadmaster Group and Moore Freight. Flatbed carrier Tennessee Steel Haulers, founded in 1976, mostly hauls additives, steel and building materials in the eastern United States. Daseke credited Tennessee Steel Haulers for the use of owner-operators and estimated that about half of Daseke’s revenue in the future will come from asset-light sources such as brokerage, logistics or owner-operators. The Roadmaster Group, a Phoenix high-security carrier, will complement the September merger with R&R Trucking. Both fleets transport arms, ammunition, explosives and munitions for the Defense Department and defense contractors. “Roadmaster is the largest munitions carrier for the Department of Defense and is authorized to operate one of the three privately run Department of Defense approved, secured terminals in the United States. R&R Trucking operates the other, too,” Daseke said on a conference call with industry analysts. He and Chief Financial Officer Scott Wheeler also highlighted potential growth opportunities in high-security cargo to haul high-value, time-sensitive technology freight, although neither would reveal clientele, even after one analyst jokingly referenced the “fruit” company Apple Inc. But Daseke disclosed a list of its top 10 blue-chip customers, which featured household names such as Boeing Co., Caterpillar Inc. and General Electric Co.
Daseke also emphasized that while there’s overlap between Roadrunner and R&R and among Tennessee Steel Haulers, Boyd Brothers and WTI Transport, all the carriers will operate in tandem rather than separate silos. Moore Freight Service, based in Mascot, Tenn., is one of the three largest commercial sheet glass haulers, a fragile material that requires specialized handling. Moore’s service territory consists of the Midwest, East Coast and Canada. 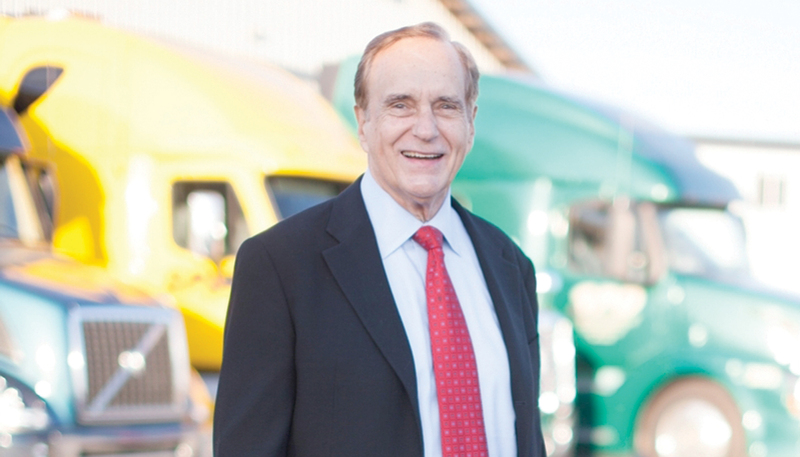 “Daseke’s unique philosophy — ‘investing in people’ — was the concept that made myself and my family realize Daseke was the right fit for Moore Freight Service. With the support of Daseke, we are gearing up to become an even stronger force in our niche,” CEO Dan Moore said. Daseke said that small flatbed carriers typically don’t invest the capital and training necessary to haul commercial glass and big manufacturers typically only want to work with established fleets with the proper credentials. “Moore knows the glass business. They have special trailers and they have patents on the equipment on the trailers. And they know how to do it safely. We love their expertise. Now we will add Daseke’s financial resources to Moore to make them even more successful,” Daseke added. Daseke ranks No. 42 on the Transport Topics Top 100 list of the largest North American for-hire carriers.